Arsenal's top four ambitions gathered momentum once more, taking three points off of Newcastle. 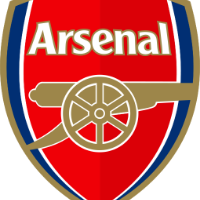 Arsenal moved above north London rivals Tottenham and into the top three with a thoroughly professional 2-0 win over Newcastle. Aaron Ramsey opened the scoring in the first half, shortly after having a goal disallowed before Alexandre Lacazette was on hand late in the game to make matters more comfortable. It was a win that cemented the Gunners top four ambitions and put them in pole position for a Champions League place at the end of the season. Without a competitive game for Arsenal in over two weeks you could forgive them for starting this match slowly. The Gunners would have liked a nice open game to get back into proceedings but Newcastle provided them with anything but as Unai Emery's men found life tough in the opening 45 minutes. Ramsey, a man destined for pastures new, donned the armband and it was a first half that was mostly about him. With around 13 minutes gone he found the back of the net after a corner was flicked on, only for the goal to be ruled out after Sokratis had tugged on Florian Lejeune's shirt. But Ramsey was to get his goal after half an hour. He played a lovely clipped pass round the defence into Lacazette who had worked hard down either channel. 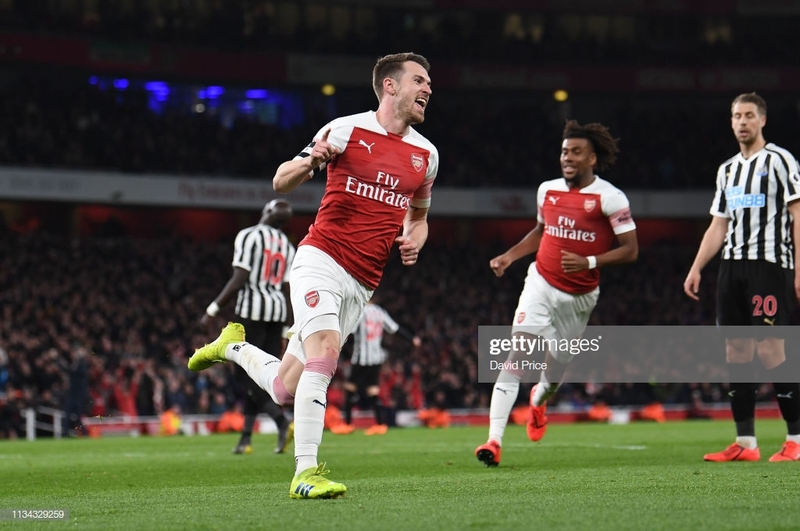 The Frenchman lost control of the ball but it fortuitously bounced back to Ramsey who put Arsenal in front, sweeping the ball home off the post from just inside the area. It was anything but a comfortable Arsenal performance, though. There were some nervy moments in midfield but Newcastle didn't have too much intent going forward. Their only chance of a steady first period came courtesy of the physical Salomon Rondon, nudging Sokratis away before forcing Bernd Leno into a save. Had it not been for Matt Ritchie, the hosts would have found themselves with a two-goal advantage with the final kick of the first half. Lacazette was able to turn and shoot but the Scot made a phenomenal headed clearance off the line. The second half brought much off the same as Arsenal struggled to make inroads. However, the introduction of Pierre-Emerick Aubameyang was a game changer in proceedings. He finally enabled Arsenal to open the play more as he burst down the channel within minutes of coming on, forcing a save from Martin Dubravka after Mesut Ozil's ball in behind. It was the Gabonese striker who played a part in the Gunners' second goal. Newcastle left themselves open for a rare moment in the game and Arsenal capitalised. Aubameyang nodded the ball past Jamaal Lascelles and Lacazette then lobbed the ball over Dubravka with the game heading towards its end. It was a goal that made the win that little more convincing as Arsenal motored into the Premier League's top three. The job Emery has done with this Gunners team, particularly in recent times, has been top notch. The midfielder's influence in Arsenal matches in recent months has been tremendous. If him leaving for Juventus for no fee didn't already confuse you before tonight then it certainly will now. He dictated the tempo well throughout the opening 45 minutes and claimed yet another important goal for his troubles. The Gunners will be hoping that an injury that forced him off midway through the second period isn't anything to worry about. One of the north London club's main threats this season has been their wing-backs, particularly in Sead Kolasinac. He has been one of Arsenal's best outlets for Emery in terms of creativity but Newcastle were able to keep him and Ainsley Maitland-Niles quiet for large periods. They sat deep and as a result allowed barely any room for Arsenal bodies to get in behind. Arsenal's player of the season could be a difficult one to decide in May. Nobody has stood out head and shoulders above anyone else but Lacazette will surely be in the running. His performances, both in terms of goals and the way he helps the team is first class. In 15 matches since the turn of the year, he's scored seven goals and claimed three assists. There is no underestimating his value to the Islington club. Rafa Benitez is no stranger to setting his Magpies team up to frustrate the big teams and that was the same story at the Emirates on Monday night. Arsenal found it difficult to break them down as Newcastle's game plan was almost executed perfectly on the night. Their display, despite the defeat, did have positives. However, a lack of attacking potency was alarming.